When first proposed the idea of this month long promotion, I asked the participating authors to post something using the theme July Fever. So far we’ve had images, flash fiction, poetry, a caption competition and the most amazing writing. Dawn is the first to put together a video, and oh boy… what a video! Before you watch, let me just tell you she’s giving away an ecopy of UPRISING to one lucky winner. To enter the draw, simply leave a comment and your email address. Heralds are the most powerful of all angels, secretive and feared, created for a single purpose. Only those most courageous and worthy earn a place within the elite choir, and only by breaking ancient oaths held sacred can the honor be stripped. It’s a punishment that hasn’t been imposed in over two-thousand years, until a single reckless act sets off a firestorm, threatening to consume all creation. Rise Hawke never suspected she’d been marked to play a role in the deadly events unfolding in the spiritual realm. Independent and resistant to authority, she isn’t thrilled when she meets Dominik, an angel with new wings, an old grudge, and a mysterious agenda he’s determined to impose. Vowing to uncover the secrets kept from her, Rise soon learns that knowing what you are isn’t nearly as dangerous as discovering why. Hunted by those who want to destroy her, and controlled by those who would see her fulfill her purpose, she is forced into a brutal battle set in motion long before she was ever born. It soon becomes clear that what one angel will risk to earn the title of Herald, is matched only by what another will do to keep it. Dawn was an avid reader from a young age, and her desire to write took hold soon thereafter. Uprising is Dawn’s first novel, but one that has been in her head for most of her life in one form or another. No matter what job she held – from being a Marine to a mother to a veterinary receptionist – she was always hearing voices and spinning tales in her head. Uprising is a blend of fantasy, spirituality, ancient arts and astrology, all woven together while keeping a foundation in the real world. 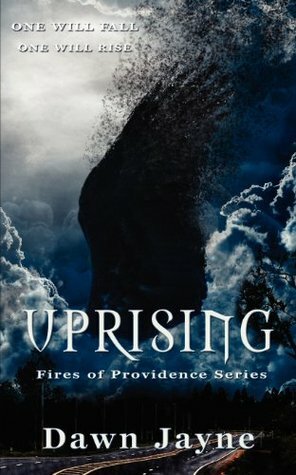 Uprising is the first book in The Fires of Providence series, and launched in November of 2012 through Time and Tide Publishing. Dawn hopes her story will be a positive contribution to the wonderful Urban Fantasy genre, and wants nothing more than her words to bring enjoyment to readers. Did not type that right. Yep I have to go with WOW too. That was fabulous! That video is hawt! 🙂 Uprising sounds great, angels have always intrigued me. Awesome, I heart me some supernatural world-building!